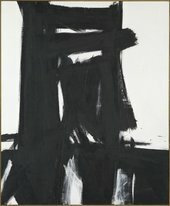 Kline began as a figurative painter, but by 1950 was making vigorous, large-scale abstract paintings in black and white. His sense of space and insistence on flatness were particularly influenced by Japanese art and many of his works have a calligraphic feel. 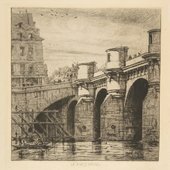 The bold directional marks in this painting also have a strong architectural sense, and it has been suggested that the work relates to an engraving of a clock tower by the nineteenth-century French artist Charles Meryon. Despite the spontaneous feel of his work, Kline often made small preparatory sketches before executing the larger paintings. Though dated on the reverse 1960, this picture was first exhibited in December 1961 with the date 1961. It was probably painted mainly in 1960 and finished or reworked in 1961. The artist's executrix, Mrs Elisabeth R. Zogbaum, has suggested that the title may be a place name, though without any direct bearing on the picture, but there seems to be no place called Meryon in the USA. (Confusion with Merion, Pennsylvania, seems unlikely). Harry F. Gaugh writes of this (8 November 1969): 'My own feeling is that "Meryon" refers to the 19th century French printmaker, Charles Meryon. 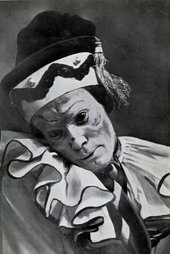 Kline's reason for entitling his painting "Meryon" might have been the artist's way of acknowledging appreciation for some of Meryon's prints. I also see a formal similarity between Kline's "Meryon" and a couple of Charles Meryon s engravings. I am investigating this matter further, and plan to include my ideas about it in an article on Kline in England. There is an inscription 'ZP 20' on the back of the canvas which was added after the artist's death in the course of an inventory of his paintings, the Z referring to Mrs. Zogbaum; thus it simply means 'Zogbaum painting 20'. When exhibited in 1964, the picture was entitled incorrectly 'Meryon ZP 19'.